1.With all the Talk About Rates Rising…The 10 Year Price is not Even Back to Late 2016 Lows. 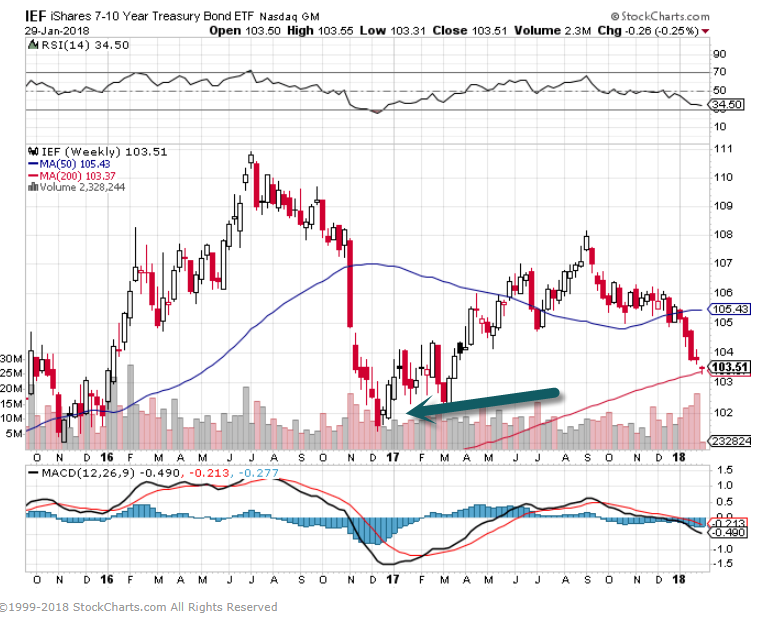 7-10 Year ETF..We have not seen lows of early 2017 yet. 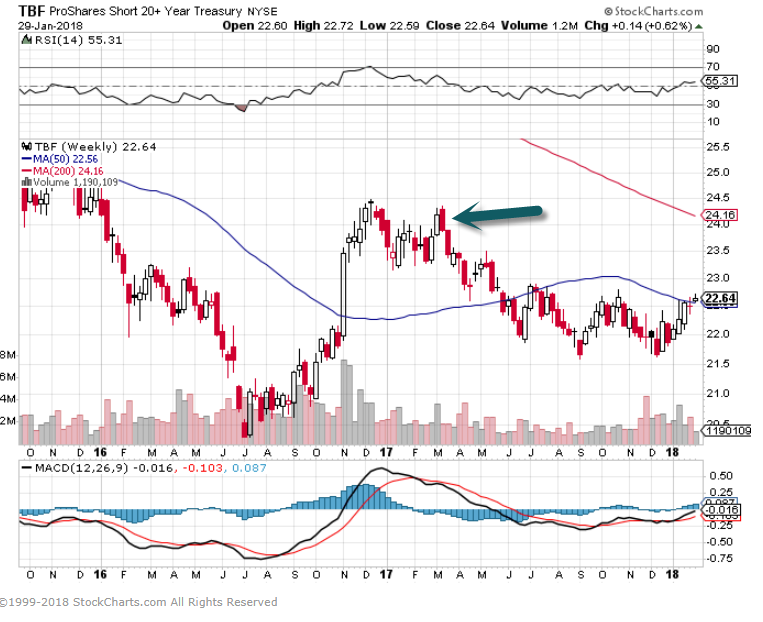 TBF Short Treasury ETF still below early 2017 lows. 2.Are International Equities Starting a Longer Cycle of Outperformance Versus U.S.? 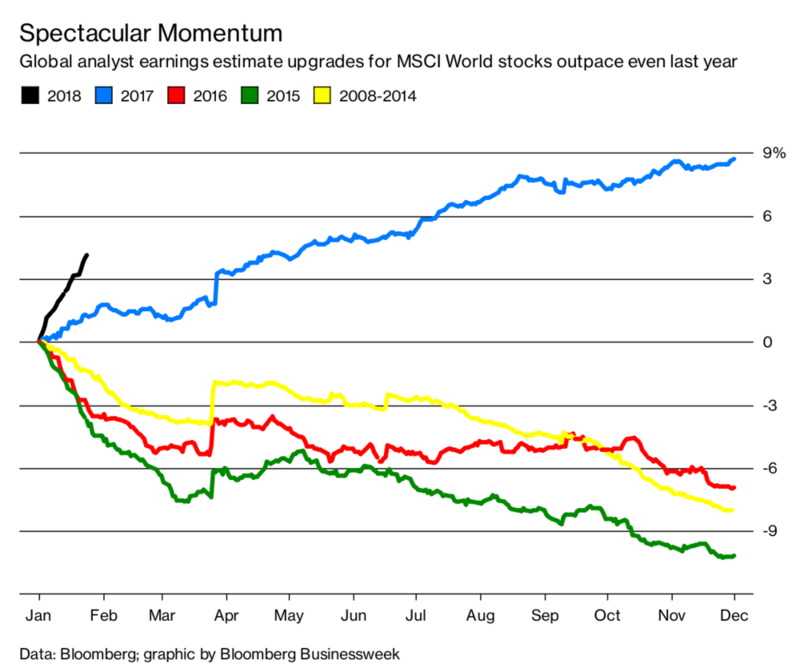 Last year international stocks got their groove back, both in absolute terms and relative to the S&P 500. Our own work suggests that the interplay between US and international stocks tends to be streaky and play out over multiple years, and that the strength or weakness of the dollar tends to lend strength or weakness to US vs international equity markets. US stocks have so substantially outperformed international markets since the economic recovery began that it would take years of relative outperformance for international to catch up with the S&P 500. A well-diversified, global portfolio is positioned for this, and a US-biased portfolio is not. 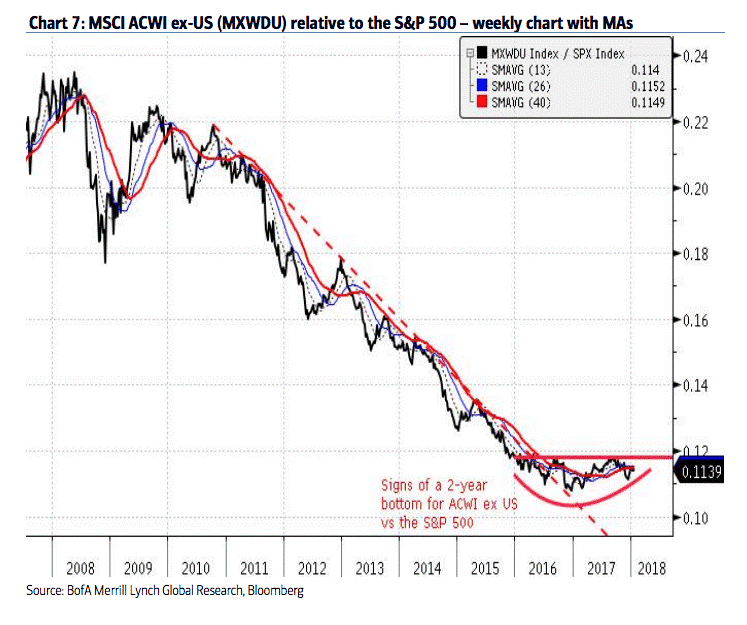 MSCI ACWI ex-US shows signs of a 2-year relative bottom vs the S&P 500. This suggests that the US equity market is at risk to lose leadership status relative to the rest of the world. A decisive breakout above the 2017-2016 relative highs is required to confirm this bottom and the potential for a loss of leadership for the S&P 500. ACWI ex-US has lagged the S&P 500 for a decade or since the 2007/2008 relative highs and a 2-year+ bottom could shift the relative trend back in favor of non-US equity markets. However, until a bottom is confirmed, the US is still leadership. So far, we have a bottoming process for international vs US – a turn higher would be the big one. Streetz is watching. As much as we want to hide from the hyperboles surrounding blockchain, it’s hard to. Blockchain, according to the experts, is a game changer to the way business is done and people are interested. According to Google and their GoogleTrends tool, those searching and interested in blockchain has skyrocketed (See chart below). 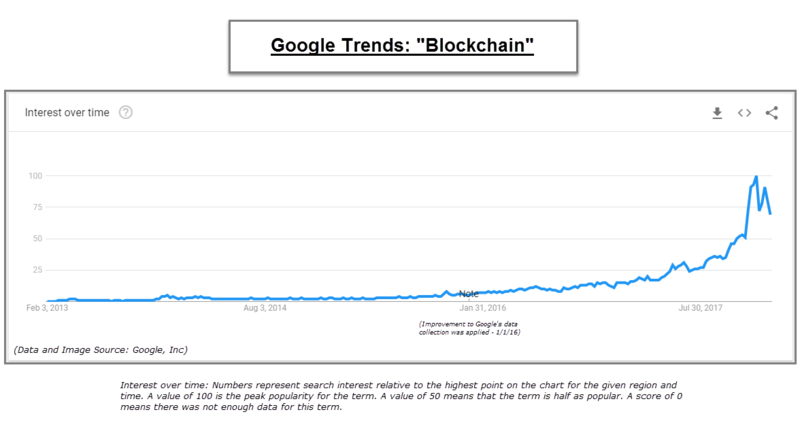 The chart tracks the interest in the term “blockchain,” based on Google search data. Starting off 2016, there was very little interest. Fast forward to the end of 2017 and you were at “peak” interest. While there is a case to be made about the blockchain technology, we think there is more of a case to be made about the sectors and some of the stocks involved, as they aren’t just “blockchain” companies.” As well, it’s another way for investors to harness the strength in the growth style box. Today sees the debut of two ETFs focused on blockchain technology, the first funds of their kind. The actively managed Amplify Transformational Data Sharing ETF (BLOK)lists on the NYSE Arca and comes with an expense ratio of 0.70%, while the index-based Reality Shares Nasdaq NexGen Economy ETF (BLCN) lists on the Nasdaq and comes with an expense ratio of 0.68%. Blockchain technology is currently in the spotlight due to public interest in bitcoin and other cryptocurrencies. Blockchain technology is really what makes the cryptocurrency world go round, and it has much wider application than just supporting digital money. 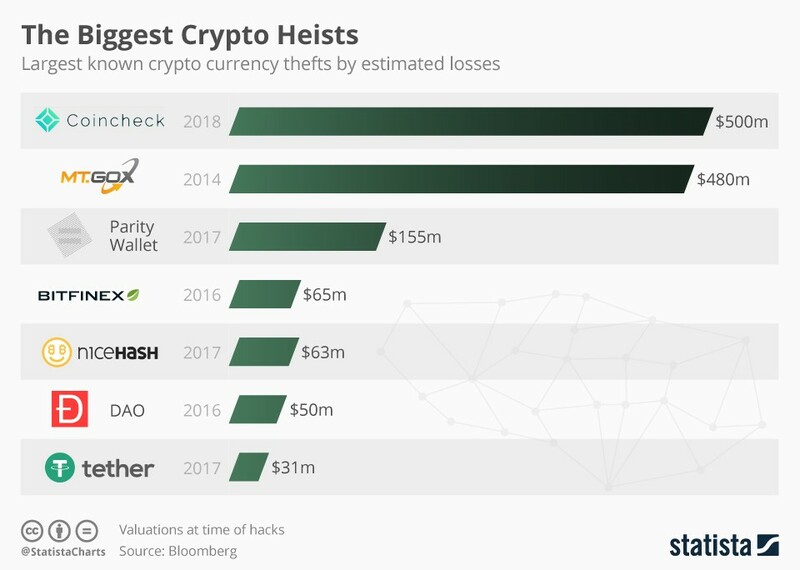 It’s basically what’s referred to as a “distributed ledger” that provides a secure and unalterable record of transactions that have taken place and other key pieces of information, storing them in linked blocks of data. BLOK was actually the first blockchain ETF to go into registration. The fund can invest in domestic and non-U.S. securities, including depositary receipts, according to the prospectus. It will focus primarily on firms that are developing or using blockchain or similar technologies. 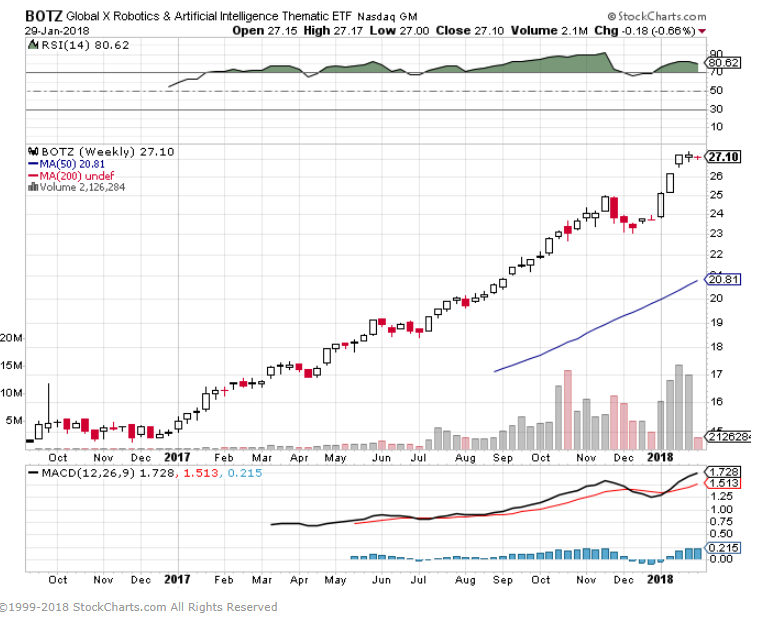 5.Trend/Theme Investing and Speculation Moves to ETFs…BOTZ Robotics ETF Takes in $2.4B in 18 Months. Pre-ETFs that was a good sized mutual fund boutique. 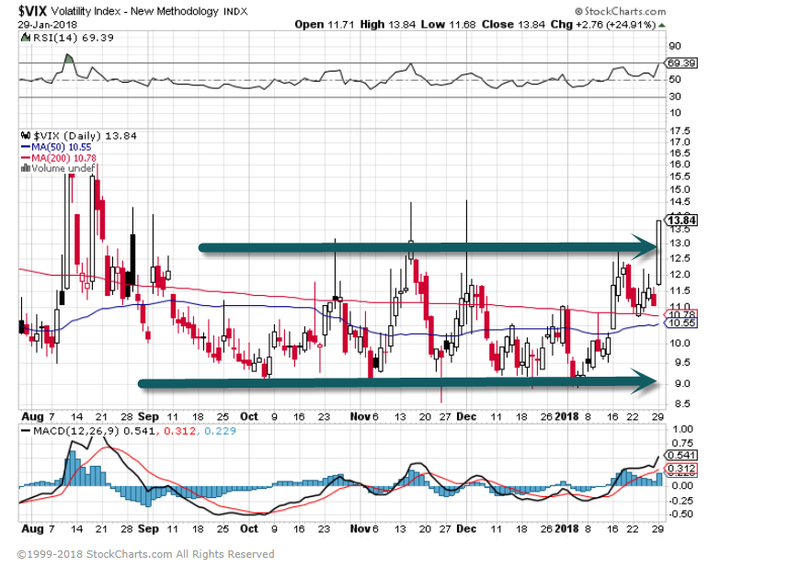 VIX breaks out of first box to Summer highs…See if another down day can push to high teens. 8.A Different Look at Some of the Data on Family Net Worth from Last Week. A greater share of Americans have more debt than money in the bank than at any point since 1962, according to Deutsche Bank economist Torsten Slok. And, in a note to clients yesterday, Slok said that, despite record stock market wealth and home price levels just shy of housing-bubble highs, Americans are poorer than at any point in nearly a quarter century. Why it matters: The data suggest that the third-longest economic expansion in history, and the lowest jobless rate in 17 years, has benefitted an exceedingly thin slice of the American public. 9.Read of the Day…Nate Silver Gives Pats 58% Chance….Hopefully It’s Another Trump Election Moment for Nate. Nate Silver’s NFL projection model is giving the New England Patriots a 58% chance to win the Super Bowl. The 58% translates to the Patriots being a 2.5-point favorite. The Patriots are a 4.5-point favorite in most Las Vegas sportsbooks. The New England Patriots are the betting favorite to beat the Philadelphia Eagles in Super Bowl LII, and Nate Silver’s model at FiveThirtyEight agrees. Using a rating system that accounts for margin of victory, home-field advantage, strength of schedule, and prior performance, and then simulating the playoffs thousands of times, Silver determined the probability each team had of winning every playoff game and the Super Bowl. So far, the model is 8-2 in the playoffs, having correctly picked both the Patriots and the Eagles to win their conference title games. The only games that Silver’s model missed so far were the Tennessee Ttians’ Wild Card upset win over the Kansas City Chiefs and the Jacksonville Jaguars’ upset over the Pittsburgh Steelers in the divisional round. Now, with just the Big Game remaining, the model is giving the Patriots a 58% chance of beating the Eagles in the Super Bowl. The percentage translates to the Patriots being a 2.5-point favorite. As of Monday morning, most Las Vegas sportsbooks have the Patriots as a 4.5-point favorite. The Patriots opened as a 6-point favorite in Vegas. Before the season, Silver’s model had the Patriots as the heavy favorite to win the Super Bowl with an 18% chance to win it all, twice as much as any other team. The Eagles were in the middle of the pack with a 2% chance to win the championship. In fact, the Eagles were given only a 21% chance to win their own division, behind both the Dallas Cowboys (34%) and the New York Giants (25%). The Eagles were given a 15% chance to win the Super Bowl before the playoffs started. The Patriots were at 31%. Every Sunday night, I send my coaching clients an accountability email. The aim is simple: Remind each one of their goals and encourage them to take steps toward success. While everyone in attendance had differing perspectives on how to get to the next level, there was one unquestionable commonality: Leadership was necessary for their success. While you may not think of yourself as a leader, everyone takes the lead in one way or another in their lives. Parents lead their children; teachers lead students; coworkers lead projects; entrepreneurs lead their sales teams; and so on. Leadership—wherever you are in life—is necessary for your success. Easy enough? In theory, yes. In practice, however, the application of these qualities is harder. So let’s take a look at how modern business leaders are exemplifying these qualities—or not—and what we can learn from them. But these days, Marchionne waffles on future development, particularly when it comes to electric cars in the Ferrari portfolio. As one recent article paints, the “Magic 8 Ball” Marchionne bobs between assuring the public electric Ferraris are a soon-to-be reality and making snide comments to media about how much he hates the idea. He also seems to waver on what to do about the growing popularity of SUVs and crossovers. What’s the result? A public that looks elsewhere for innovation. Marchionne’s indecision might just be the death knell of Ferrari as future sports and luxury cars go electric. If he’s banking on name and history to carry the carmaker, he might take a look at how that has played out for a thousand other brands that have had far too much confidence in their brand currency. If Marchionne wants to be a traditionalist, then so be it. If he wants to ride the wave of electric cars, more power to him. But he needs to pick a direction, lest he lose the confidence of the consumer. Warren Buffet once said, “If you can’t control your emotions, you can’t control your money.” ‘Nuff said. Well, not quite. These days, EQ (emotional quotient) is as important to effective leadership as IQ. Understanding employees’ needs and recognizing the interconnectedness of work and personal life is key to creating a productive, happy work environment. And as countless studies have shown, happy and appreciated employees are the most engaged. Leaders under pressure, however, often react strongly to mistakes or unfavorable information. To nip this in the bud, Buffet (among other successful CEOs) uses the 10:10:10 Rule. It’s simple enough—just ask yourself how a pending decision is likely to affect you in 10 minutes, 10 months, and 10 years. That perspective is often enough to keep you from flying off the handle and acting on raw emotion instead of reason. In the October 2016 issue of Inc. Magazine, speaker/author/guru Tony Robbins was featured as figure-of-the-moment. But it wasn’t financial success or celebrity that Inc. was interested in—it was Robbins’ confidence. Indeed, Robbins has convinced many of us that we can be just as confident—and we’re so enthralled with his unwavering certainty, we believe him. Why? Two reasons. Second, confidence is built through successful relationships. And you build those relationships not by advertising what you have to offer, but by asking one simple question of the people you meet: “How can I help?” That engenders warmth and generosity, and from that, a relationship builds—whether personal or professional. With these two clear-cut perspectives at our disposal, no wonder we feel our own confidence on the rise. Some may say that there’s more to Robbins’ confidence than these seemingly simplistic philosophies. But “fan-turned-friend” Tim Ferriss says otherwise: “Robbins has outlasted so many other life coaches because he doesn’t just dish out advice—he actually takes risks.” In other words, he models the behavior he asks others to take. And his modeling follows the same “simplistic philosophies” he encourages others to follow. What should a CEO realistically ask of his or her employees? And what’s the best way to share those expectations with those who need to meet them? As part of Harvard Business Review (HBR)’s CEO Genome Project, a 10-year study designed to identify the attributes of high-performing CEOs, four key behaviors came to the fore. Preparation and performance were, not surprisingly, tops on the list—as was confident decision-making—but equally as important was a CEO’s establishment and communication of expectations. Reliability, countless company board members affirm, is one of the main reasons for hiring a new CEO. That stands to reason; their results are consistent year after year, and it’s easy to unpack their successes. In other words, expectations are understood from both sides—what the company expects of its CEO and what the CEO reasonably expects of his/her employees. And those expectations aren’t culled from emotional or impulsive decisions; rather, careful research and observation serve as the foundation. The last, critical piece of this behavior is communication of both the expectations themselves and an ongoing assessment of how the entire company—from the top down—is meeting those expectations. In the wake of reams of bad press on United’s handling of passenger dos and don’ts—including forcibly removing a passenger from an overbooked flight— CEO Oscar Munoz earned PRWeek U.S.’s Communicator of the Year Award in 2017. There are two sides to every story, of course, and this one is no exception. Some of Munoz’s under-the-radar communication of needs, appreciation, and expectations was indeed laudable. PRWeek relates, “Munoz won praise from union bosses for his easy rapport with shop-floor workers, a rarity in any industry. Undertaking an extensive meet-and-greet tour across the United network, Munoz rebuilt employee confidence in the airline brand. PRWeek justified its decision by pointing to Munoz’s less glamorous achievements during his years at the helm. And while many rightfully argue United’s passenger abuse never should have happened, Munoz chose to communicate his responsibility in light of the expectations of him as CEO, instead of avoiding it altogether. These examples, both of what to do and what not to do, make clear the unshakeable value of leadership in all industries. Even beyond business, leadership helps foster relationships, support communities, and encourage innovation. So if my accountability email were to land in your inbox tomorrow, what leadership skills would you say you need to work on? Imagine how much more successful your life would be if you did.